Archbishop William E. Lori’s first visit to St. Joseph in Sykesville May 31 included the dedication of the parish’s new Formation and Fellowship Center. Technically, the space is repurposed, as the parish of 3,200 families spent $2 million to convert an old gymnasium. According to Marianist Father Neville O’Donohue, pastor, the space can be divided into two areas. It includes a kitchen, is fully audio-equipped and opens onto a wooded area. Tom Schwartz, facilities supervisor, was asked to join Archbishop Lori for a ribbon-cutting ceremony. “Tom was very involved in the whole process,” Father O’Donohue said. 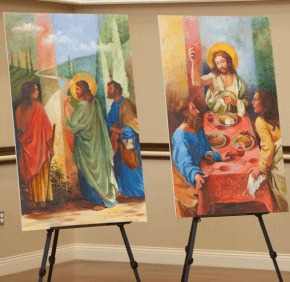 The center includes the commissioning of two oil paintings on wood by local artist Gordon Daugherty, depicting scenes from the Gospel of Luke. According to Father O’Donohue, the first panel shows Jesus accompanying two disciples on the road to Emmaus. Archbishop Lori centered his homily at 10 a.m. Mass on the day’s feast, the Most Holy Trinity, and connected it to the dedication of the center. “Christian formation is not merely learning about Jesus, nor is it merely a question of learning Gospel values,” he said. “Rather, Christian formation is all about our entering – body, mind and spirit – into the redeeming presence of Christ, who leads us to the Father in the Holy Spirit. That, the archbishop said, ties into the second purpose of the center. The morning included an acknowledgement of Marianist Father Paul Reich, associate pastor of St. Joseph, who is retiring to the order’s community in Dayton, Ohio. Father Reich spent 29 years at the faith community in southern Carroll County. He will be feted with a farewell dinner at the new center June 13. The celebration of the May 31 Mass included another associate pastor, Marianist Father David McGuigan; Father John Worgul, pastoral associate for evangelization; and Deacons Michael Dvorak and Vito Piazza Sr.